Mike Sainristil has been simply electric for Everett, but can he and the Tide hold off surging St. John's Prep? It's time for SuiteSports editors Matt Feld and Joe Parello to make their picks for all the top action coming up in week three. Parello’s Pick: I need to make up some ground on my boy Matty, but if you think I'm betting against the Crimson Tide, even against an impressive SJP unit, you've got another thing coming. 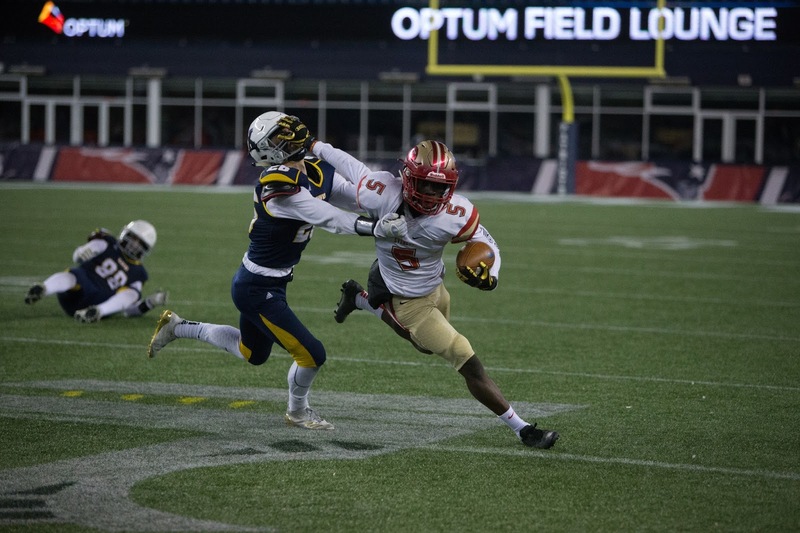 Feld’s Pick: Still seething over a blowout loss to the Crimson Tide in last year's postseason, St. John's Prep comes ready to play firing on all cylinders. The Eagles hang for three and a half quarters, but the Crimson Tide offense wears St. John's Prep down and Everett escapes against a dangerous Eagles' team. Parello’s Pick: Ok, here's my upset special of the week. While I love the North Andover passing game (Gabe DeSouza is a PLAY-MAKER), I'm calling for a young, but talented, CC team to grow up this weekend, and learn from last week's loss to the Prep. Feld’s Pick: Jake McElroy and the Scarlet Knights have a chance to showcase that their offense is the real deal, and after the Raiders physicality holds them down for a half, North Andover breaks free over the final 22 minutes to get a key win for the postseason resume. Parello's Pick: Can Franklin shock the Hock? It honestly wouldn't surprise me, but you have to love the speed and potential of this Mansfield team. In what has suddenly become a must-see matchup, I'll take the Hornets on a late Damani Scott touchdown pass. Feld’s Pick: It's easy to forget, but Franklin was in position to beat Mansfield last season before a personal foul penalty wiped a Panthers' touchdown off the board. In my first hot-take of the season, the Panthers force a pair of key turnovers, and score late, to get a big road win. Parello's Pick: Much is being made of Shrewsbury's apparent struggles last week, but don't be fooled: Grafton is a talented team that always plays with plenty of fight, and Shrewsbury quarterback Drew Campanale's refusal to lose against the Indians is a great sign for the Colonials if they hope to emerge from a crowded D3 Central field. Groton-Dunstable is another one of those teams that is better than you think, but Shrewsbury comes out firing on all cylinders Friday night. Feld's Pick: The Colonials survived a bit of a scare last week, but I expect the offense to get back on track this week against a Groton-Dunstable team that will be loaded for bear. Parello's Pick: King Philip lost a game?!?!?! They aren't used to losing out in Wrentham, and I don't think they make a habit of it. Feld's Pick: Ryan Halliday is starting to cement himself as one of the top backs in the Hockomock, while Robert Jarist made big strides in his week two performance versus Foxboro. Attleboro is huge up front, highlight by Qualeem Charles and Nik Evans. King Philip uses the experience it attained in week one to pick up a big road win. Parello’s Pick: Sneaky good game here, but Needham's aerial assault gets it done in the fourth. Feld’s Pick: I am yet to be convinced that any opponent in the Bay State has the personnel to cover Needham's multitude of weapons, starting with Matt Smith. Parello’s Pick: After getting stuck in the mud a bit last week against New Bedford, look for the experienced W-H offense to bounce back in a big way, setting up a massive showdown with Duxbury next week. Feld’s Pick: The most interesting matchup of the weekend in my opinion, both of these teams are fighting with Duxbury to claim the the title of top-dog in Div. 3 South. I am giving the nod to Hingham, whose athleticism up front, and ability to control the ball on offense proves to be just enough. 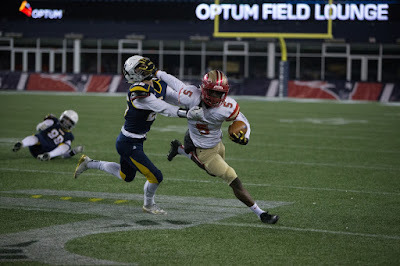 Parello’s Pick: I love the play making abilities of Shane Aylward and the Tewksbury offense, but I'm just not conviced the Redmen can stand up to BC High's offensive line and stable of backs. This one could turn into a shootout, albeit it with two different styles of offense, and I just think BC High will be able to get tough yards more consistently. Eagles in a squeaker. Feld’s Pick: While Marhsfield may be a little down this year, getting the first win out of the way can be key for a relatively inexperienced team such as the one BC High currently has. Two weeks after putting up a respectable effort versus a veteran Mansfield team, the Eagles return home to pick up their first home win of the season with Joe Brink having his best game to date. Parello's Pick: It took some time to wake up, with an opening week loss to Minnechaug, and a 20-0 deficit last week, but once Longmeadow's offense got going, there was no stopping the Lancers. Their 43 unanswered points against West Springfield have me thinking this team is ready to start stringing some wins together, until the schedule really beefs up with Springfield Central and Westfield in mid-to-late October. Feld's Pick: These two offenses are both looking for a trackmeet, and based on their respective early results its easy to expect one on Friday night. Longmeadow, however, picked up an impressive 43-20 road win over West Springfield last week, making me believe they are more than ready for whatever Northampton throws at them. Parello's Pick: Think this is an old Central Mass slugfest? Think again, as Nashoba's Sam Bolinsky and Fitchburg's Andrew Brooks are the second and third leading passers in the region, respectively. That means this battle of programs built around brutal ground games could be decided through the air. If that's the case, gimme the undefeated Chieftains, but watch out for Fitchburg, which played Shepherd Hill to the wire last week. Feld's Pick: Fitchburg may be 0-2, but this road-trip for Nashoba is sure to be anything but a breeze. The Chieftains are coming off a season in which they reached the Div. 4 Super Bowl, and have showed no signs of slowing down so far this in 2018. That won't change on Friday as they win a rock-fight.